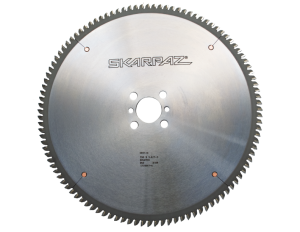 An extensive selection of blades designed to cut brass, copper, aluminum and other non ferrous metals. Excellent performance on sheets and extrusions. 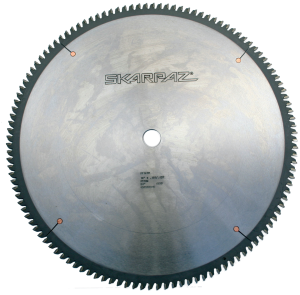 Heavier plates are used to withstand the rigors of non ferrous metal cutting. 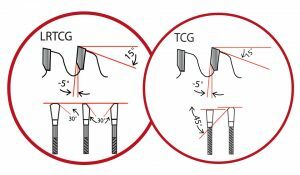 Thin kerf blades should only be used on thin material and must be used only with mechanical clamping and lubricant. All non ferrous metal cutting should be aided by flood or spray lubricant. Mechanical clamping is recommended for all blades. AG3782038 3.7/8" 20T 5TC2 .110 .135 3/8"
AG3782458 3.7/8" 24T 5TC2 .110 .135 5/8"
AG42034 4" 20T 0TC2 .095 .125 3/4"
AG42078 4" 20T 0TC2 .095 .150 7/8"
AG42478 4" 24T N2TC2 .085 .110 7/8"
NF74N 7" 40T N5TCG .085 .115 5/8"
NF860 8" 60T 0TCG .085 .115 5/8"
NF86N 8" 60T N5TCG .085 .115 5/8"
NF88N 8" 80T N2TCG .085 .115 5/8"
PS860T 8.1/4" 60T 0TCG .070 .095 5/8"
P86NT 8.1/2" 60T N5TCG .059 .090 5/8"
P860T 8.1/2" 60T 0TCG .070 .095 5/8"
NF960 9" 60T 0TCG .085 .115 5/8"
NF1040 10" 40T N2TCG .098 .165 5/8"
P1060T 10" 60T 0TCG .059 .090 5/8"
NF106N 10" 60T N5TCG .085 .125 5/8"
P1080T 10" 80T 0TCG .059 .090 5/8"
NF108N 10" 80T N5TCG .095 .125 5/8"
MN1090 10" 90T N5LRTCG .100 .125 5/8"
P1010T 10" 100T 0TCG .059 .090 5/8"
NF1010 10" 100T 0TCG .095 .125 5/8"
NF101N 10" 100T N5TCG .095 .125 5/8"
NF1240 12" 40T N2TCG .110 .150 1"
P126NT 12" 60T N5TCG .085 .115 1"
NF1260 12" 60T 0TCG .095 .125 1"
P1272T 12" 72T 0TCG .085 .115 1"
P1280T 12" 80T 0TCG .059 .090 1"
DM1280T 12" 80T 0TCG .095 .125 5/8"
NF1280 12" 80T 0TCG .095 .125 1"
NF128N 12" 80T N5TCG .095 .125 1"
MN1290 12" 90T N5LRTCG .110 .135 1"
P1210T 12" 100T 0TCG .059 .090 1"
P1210T-095 12" 100T 0TCG .070 .095 1"
DM1210T 12" 100T 0TCG .095 .125 5/8"
NF1210 12" 100T 0TCG .095 .125 1"
NF121N 12" 100T N5TCG .095 .125 1"
DM1210MN 12" 102T N2LRTCG .100 .125 5/8"
DM122N 12" 120T N2TCG .095 .125 5/8"
NF122N 12" 120T N2TCG .095 .125 1"
MN212 12" 120T N2LRTCG .095 .125 1"
NF1440 14" 40T 0TCG .110 .160 1"
NF1460 14" 60T 0TCG. .120 .155 1"
P148NT 14" 80T N5TCG .085 .120 1"
NF1480-138 14" 80T 0TCG. .098 .138 1"
NF1480-150 14" 80T 0TCG. .120 .150 1"
NF148N 14" 80T N5TCG .120 .155 1"
P1410T 14" 100T 0TCG .070 .102 1"
P141NT 14" 100T N5TCG .085 .200 1"
NF1410-138 14" 100T 0TCG .098 .138 1"
NF1410-150 14" 100T 0TCG .120 .150 1"
NF141N-138 14" 100T N5TCG .098 .138 1"
NF141N-150 14" 100T N5TCG .120 .150 1"
DM1410T 14" 100T 0TCG .120 .155 5/8"
DM142N 14" 120T N5TCG .110 .140 5/8"
NF142N 14" 120T N5TCG .110 .140 1"
MN1412 14" 120T N5LRTCG .134 .165 1"
NF1580 15" 80T 0TCG .120 .160 1"
P151NT 15" 100T N5TCG .095 .125 1"
NF1510 15" 100T 0TCG .110 .160 1"
NF1630 16" 30T 0TCG .150 .200 1"
NF1640 16" 40T 0TCG .120 .165 1"
NF1640-114 16" 40T 0TCG .120 .165 1 1/4"
NF1660 16" 60T 0TCG .120 .165 1"
NF1660-200 16" 60T 0TCG .150 .200 1"
NF166N 16" 60T N5TCG .134 .173 1"
NF1680 16" 80T 0TCG .120 .150 1"
NF1680-200 16" 80T 0TCG .150 .200 1"
NF168N 16" 80T N5TCG .134 .173 1"
NF1610 16" 100T 0TCG .120 .155 1"
NF161N 16" 100T N5TCG .134 .173 1"
NF1620 16" 120T 0TCG .120 .150 1"
NF162N 16" 120T N5TCG .120 .155 1"
MN1612 16" 120T 5LRTCG .134 .165 1"
NF1836 18" 36T 0TCG .150 .205 1"
NF1860 18" 60T 0TCG .150 .200 1"
NF1880 18" 80T 0TCG .134 .173 1"
NF188N 18" 80T N5TCG .150 .200 1"
NF1810 18" 100T 0TCG .134 .177 1"
NF1812 18" 120T 0TCG .134 .173 1"
NF182N 18" 120T 0TCG .134 .173 1"
NF1840-1 18" 140T N5TCG .115 .145 1"
NF2080 20" 80T 0TCG .145 .195 1"
NF2010 20" 100T 0TCG .134 .173 1"
NF201N 20" 100T N5TCG .134 .173 1"
NF2020 20" 120T 0TCG .134 .173 1"
NF202N 20" 120T N5TCG 134 .173 1"
NF2015 20" 150T N5TCG .134 .164 1"
NF2215 20" 150T N5TCG .150 .200 1"
NF2412 24" 120T 2TCG .160 .215 1"
NF2415 24" 150T 5TCG .150 .210 1"
NF3512 350 120T 0TCG 2.8 3.6 1"